Here are a few short steps to one of my DIY projects incase you'd like to do something similar at home. I bought wooden letters about six inches tall and painted them an ivory color. I wanted these letters to go along with the vintage look, so I used a lace window panel I found at a garage sale for $1. I cut off the casing at the top, which gave me more than enough fabric to work with. I made sure to cut to the left of the seam so it wouldn't unravel. Next, I traced by letters. I wanted the fabric to cover only the surface of the letter. If you want your fabric to wrap around the entire letter, make sure to leave more room. Then cut it out! I left about a quarter of an inch from my trace line, just in case the fabric moved. 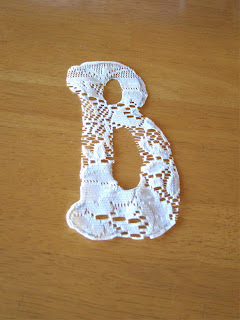 After that, I glued the lace onto the letters with rubber cement glue. I'm sure there is a better glue to use, but that is all I had and it served its purpose [at least for the time being].